During our journey to the Swiss Alps we’ve visited Strassbourg shortly “zum bummln” which is German for doing some shopping. 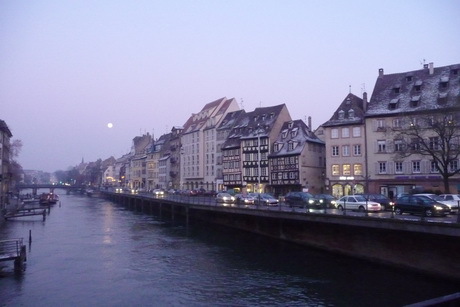 Usually we tend to race along without paying any attention to this French city bordering on the river Rhine which forms the border between France and Germany. Its center is well preserved. My first photo shows the cathedral with its characteristic unfinished one spire tower. Apparently the canals are used for cooling some local industries, as they are not frozen and the swans can peacefully use them. The second photo shows some of its ancient housing with an almost full moon. For these posts I’m working on a new eee Asus netbook. First I tried to resize my photos with Irfanview, but that shareware programm crashed time after time. Now I’ve done the resizing with an ACDsee trial version. Not sure whether the photos are sharp enough as my working screen is only 9 inch…. 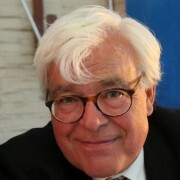 Ref the photo sizing problem, you could upload to Flickr, paste in the Flickr link and then in the HTML resize the dimensions to fit. This post and the photos brought back good memories. 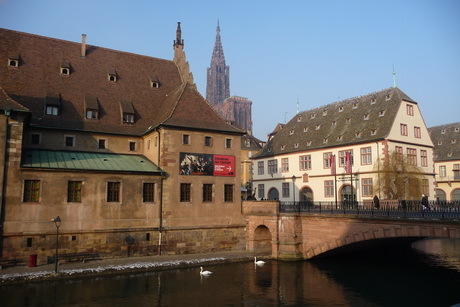 We made Strasbourg a regular visit each February for the Association of French Independent Vintner’s Wine Festival (Salons de Vins). Although the main event was always wine tasting and buying (a fantastic event), we sobered ourselves by walking through the city in the brisk weather. The view of the buildings along the river with a light layer of snow on top is magical. There is a little local market in the old town called the Market of the Suckling Pig – a great market with an even better name. Great ideas. Thank you for the pointer. Years ago my DW attended a quilt show in Strassbourg and ever since wanted me to visit it. A couple of months ago we did it for the first time in search of a little shop that sells needle patterns. Then it was closed. Luckily for her it was open now. Beautiful images. I love the way European cities developed along their great rivers. Impressive architecture, cobblestone roads (often), and lots of small shops for the communities.